If they ever get around to repaving central Albany’s old streets, I hope they don’t tear out this rusty reminder of the city’s history in advanced — for the time — passenger rail. This broken rail in the crumbling pavement of Fifth Avenue is what’s left of the Oregon Electric track that once ran the length of the street from the west end of town to Main Street in the east. You can find summaries of the Oregon Electric’s history online. It was built starting in 1906, went south from Portland and reached Albany on July 4, 1912, and Eugene later that same year. A branch went went to Corvallis from a point called Gray, a little south of Pirtle. There were several trains a day. Maxine Humphrey, who grew up on her family’s Oakville farm and died in 2008 just short of her 93rd birthday, once told me she rode the Electric to go to high school in Albany in the 1930s. The line was doing great for a while, carrying passengers in well appointed cars, and earned a profit of $1 million in 1920. But it went downhill from there because buses and private cars were catching on. Service to Corvallis was stopped in 1931, and all passenger service on the line ended in May 1933. The Albany station now is Ciddici’s Pizza. That’s where the steel rails have begun to re-emerge after being paved over years ago. I checked old USGS maps. The track along along Fifth Avenue still appears in one from 1944. But by 1957 it was gone, at least according to the map. This map dates from 1917. 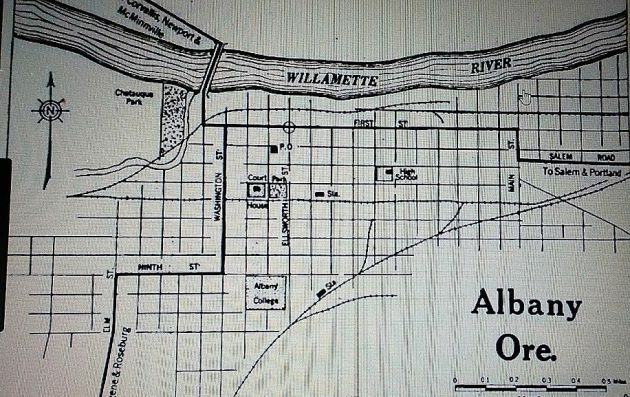 It clearly shows the Oregon Electric and its station on Fifth Avenue. Did find some tracks on Santiam near Elmers? I’d rather have nicely paved streets than rails sticking up through the pavement. It’s a cool history thing, but that’s what the museum is for. Well, now I have to have a look at that rail. I agree with Hasso. These reminders of our history are much more interesting in situ than they would be in a museum. I agree, Hasso. I live next door to this. My parents and three siblings all hail from Cambridge, NE. (I’m the lone Oregonian). Not far from Cambridge is McCook, a small town of 7500. 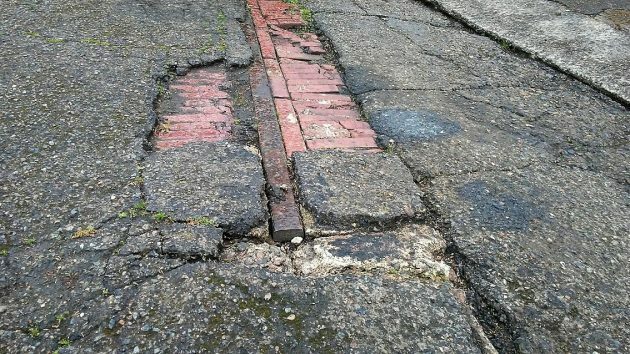 Along with boasting a Frank Lloyd Wright home (the Sutton House) McCook still has some streets paved with bricks from the early 1900’s. They’re not only a part of history, like the Sutton House, but a reminder of when times were different and the care and craftsmanship that often went into making things last. I too like soft, smooth streets. But if you’ve never driven on streets paved with bricks, the sound alone is a thing of beauty. So if this part of history can be preserved as is in Albany, especially next to the old station, it most definitely should. The rail is a cool reminder of another time. Finding an intact brick layer is beyond cool. Probably not up to current wear and tear, but still cool. If you can find/look at a 40’s & 50’s maps from the air of our town you’d see an old rail line going N/E from the main rail yard. A tiny segment is still there going behind Crabtree Automotive & back into the rail yard. In ’71 when I arrived this line did crossed Hill St & ended just sort of Oak St. The maps showed that it continued further N/E & crossing what is now I-5, thru Timber Linn Park and N/E towards Stayton, OR. In Timber Linn Park you can find the old rail bed in places at the N/E area. Albany wasn’t called “Hub City” for nothing owing to it’s being a “Hub” for connecting rail lines.